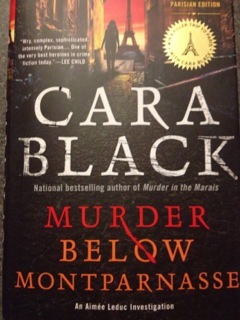 I blogged about Cara Black and her heroine, Aimée Leduc three years ago. I was just reminded of Aimée by Arles Lucy because she shared Bonjour Paris‘s interview with Cara. I am ready for the next novel!! 2017, set in Saint Germain. 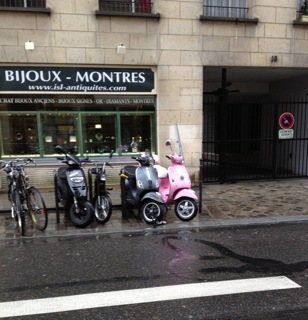 If you have read any of Cara Black’s Aimée Leduc novels, you know the significance of this pink Vespa that I photographed during my recent trip to Paris. AND I even spotted it on Ile St. Louis. Pink Vespa + Ile St. Louis = Aimée. It must be hers. I accidentally stumbled upon Cara’s books while roaming the aisles of Barnes and Noble a few years ago. Each murder mystery is set in a different neighborhood of Paris. I’ve read them all. I am reading the most recent one right now. It came in the mail while I was in Paris. Aimée has a private detective/computer security business passed down to her by her grandfather. Her father was a police officer who was blown up by bad guys. 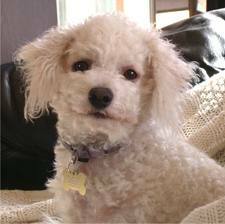 Her godfather is one of the top dogs of the Paris police force. Her mom abandoned her when she was eight years old. Aimée dresses in vintage designer clothes she finds at the flea market. 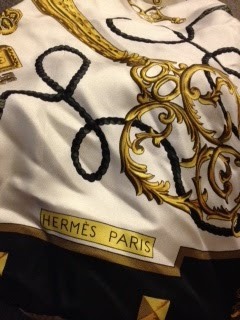 In the latest book, she wraps a Hermès scarf around her neck before going out. I have one, too, Aimée!! I found it for $5 at one of the local consignment shops. 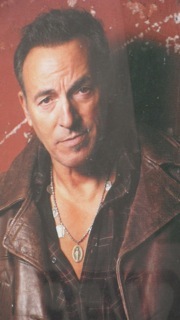 He was in concert in Paris last summer while I was there. Maybe Aimée went to hear him? Her latest love interest is a flic, a cop, but it isn’t going well at the moment. Her best friend and business partner, René, has been lured to Silicon Valley, but he is in over his head, too, although Aimée doesn’t know it yet. I really shouldn’t give away any more of the plot. I want to race through the book, but I am trying to slow myself down and savor it. I could stay up all night and gobble it up, but I would have a sleep deprivation hangover worse than I already do and it will be a while before Cara comes out with the next book. 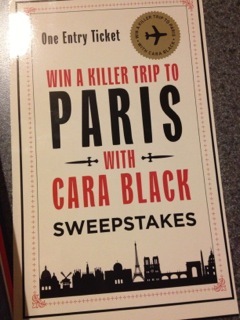 At the very great risk of messing with my odds for winning, Cara has a contest associated with this book. I plan to win. A week in Paris with Cara tracing the footsteps of Aimée. Details are inside special editions of the book and on Cara’s website. I promise to blog all about it while I am there. Aimée often forgets to eat while she is out looking for clues to the latest mystery. 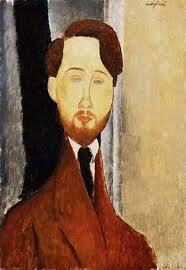 In Murder Below Montparnasse, she is on the trail of a stolen Modigliani painting. I have seen his work in museums but needed to google him. 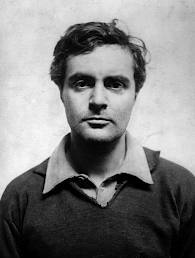 He was an Italian painter and sculptor, but he lived mainly in France. He painted a lot of portraits. His style is very distinct. Anyway, while on the trail of a stolen portrait of Lenin, Aimée talks to a woman who has just taken a batch of financiers out of the oven. Aimée eats half of the still warm cakes. This is my first time making them. They are a Parisian concoction, created by a baker in the 19th century. 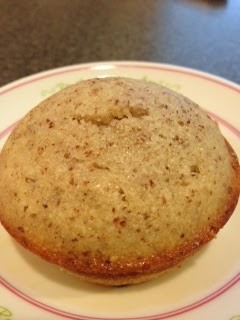 Enjoy the book and make some financiers of your own. Aimée would approve, I think. I do not have financier molds. I used a cupcake tin, buttering and flouring each cup. And do be careful about browning the butter. It cooks pretty quickly- I boiled mine for about 3 minutes. I was so excited to finally find ground almonds at Harris Teeter. I found them in a special section of kosher foods since it is almost Passover. Tea time on this rainy chilly Sunday in North Carolina… I don’t think my little cake will make it long enough to be room temperature. Désolée, Dorie! Aimée didn’t wait either. Center a rack in the oven and preheat the oven to 400 degrees F (200 degrees C). Butter 12 rectangular financier molds (these were tested in 3-3/4 x 2 x 5/8-inch [10 x 5 x 1-1/2-cm] rectangular molds that each hold 3 tablespoons), dust the interiors with flour and tap out the excess. Place the molds on a baking sheet for easy transport. Fill each mold almost to the top with batter. Slide the molds into the oven and bake for about 13 minutes, or until the financiers are golden, crowned and springy to the touch. If necessary, run a blunt knife between the cookies and the sides of the pans, then turn the cookies out of their molds and allow them to cool to room temperature right side up on cooling racks. Bon appétit and happy reading! !